With a sleek size, portable features, and high-end grilling technology, the Davy Crockett pellet grill from Green Mountain Grills is a must see. This wood pellet grill can be used for virtually any type of grilling situation. To give your food the traditional wood flavor, this grill is equipped with open flame technology. It also comes with 100-volt and 12-volt adapters, so you can use the grill from an outlet or 12-volt battery. On top of all that, this grill is designed to be portable and is very easy to take with you wherever you’re headed. The legs can fold up and act as handles for easy transport and storage. When open, the legs offer plenty of support to keep your grill steady. Also, when the legs are folded, they keep the lid from accidentally opening. The unique part of this grill is the “Sense-Mate” thermal sensor. This feature constantly monitors the grill temperature. This will come in handy when you're waiting for the right time to put your meat on the grill. Whether you’re going camping, tailgating, to the park, or just grilling in your backyard, you’ll be able to take the Davy Crockett pellet grill with you and start cooking good foods. The Camp Chef PG24 Pellet Grill is arguably the easiest grill to use on the list, thanks to the smart digital temperature control. This feature monitors the temperature as the automatic auger feeds wood pellets into the grill. With this system, you won’t have to stand next to the grill to control every little detail. The digital control will display temperatures ranging from 160-degrees Fahrenheit to up to an overwhelming 500-degrees Fahrenheit! You can also use the meat probe to check the internal temperature of your meat if you feel skeptical about how well it’s cooking. The large cooking area is measured at 570 square inches, including a removable upper warming rack. This will save you a ton of time when you’re cooking for a large group of people at once. In addition to the cooking aspect, cleaning won’t be too strenuous either. Simply pull a lever to utilize the exclusive ash clean out system. With this cleaning system, you will spend less time dumping ashes and more time enjoying yourself in the warm weather. You can do almost anything with the Camp Chef PG24. This grill can be used to grill, smoke, bake, and roast food; giving you plenty of options on how to make your meats. 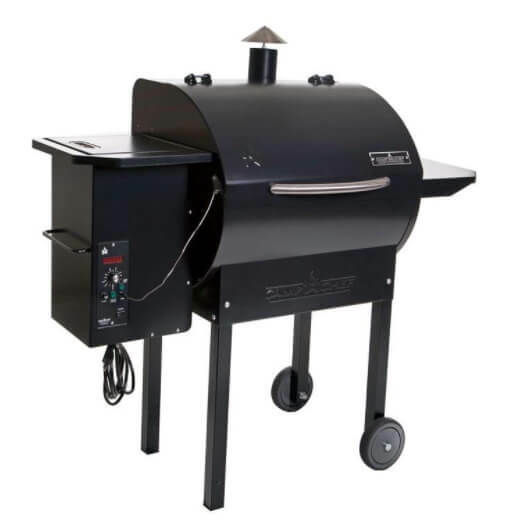 The Pit Boss 71700FB pellet grill offers a large surface to cook on, with a fast-paced digitally controlled burn system. 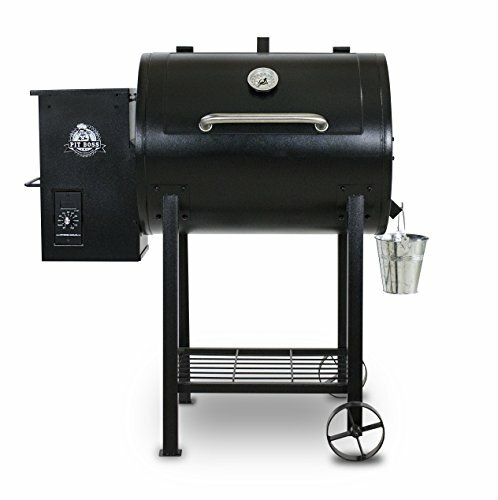 You get 700-square inches of total cooking space and includes features for cooking ribs, pork, or brisket. The digital controller offers temperatures ranging from “smoke” to 475-degrees Fahrenheit. 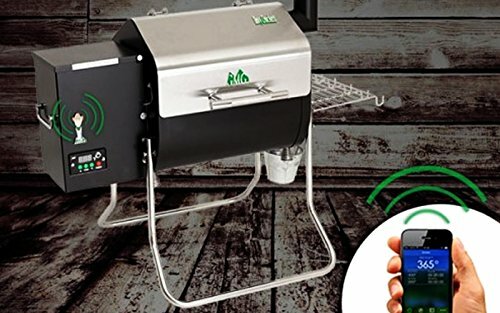 This wood pellet grill does not come with a PID controller, although you can purchase one separately if you want to better monitor the temperature. The body of this grill is durable and easy to clean as well. The porcelain coated cast iron grids can be wiped with a slightly damp cloth. This material will also help prevent excessive amounts of rust, in case you accidentally leave the grill uncovered during a rainy night. There is also an ash pan on the side that can help you easily dispose of leftover ashes when you’re finished grilling. Overall, the main reason why people like this wood pellet grill is because there is so much you can do with it. 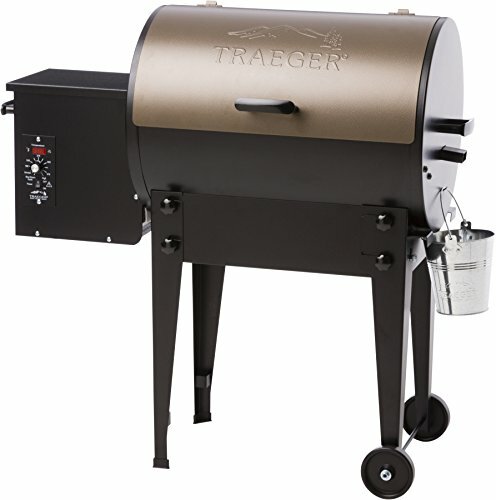 Coming in at #5 on this list is the Traeger Tailgater Series grill. The highlight of this grill is the LED digital controller. This visible LED display will show you the current temperature of the grill, which could range anywhere from 180-degrees to over 375-degrees Fahrenheit. These are reasonable temperatures that will easily heat up the 300-square inch grilling surface. Getting this grill ready to cook is a straightforward process. All you’ll have to do is place the wood pellets into the smoke box and they will proceed to go throughout the grill; burning in the process. The folding legs are another benefit to having the Traeger Tailgater Series grill. You can fold the unit up and place it in a closet, shed, or the back of a large vehicle. There are two wheels on the bottom to improve mobility on most terrain. The only serious concerns about this grill are related to its construction. Past users have claimed that the quality of this grill isn’t very durable; and the ambiguous instructions don’t help the cause either, as they’ve been known to be very difficult to understand. Though, if you want to start grilling immediately and don't want to spend much money, this is a wonderful choice. When searching for a new wood pellet grill, you will find a limited variety of brands and sizes to choose from. There are things to look for that will determine which wood pellet grill is best for you. Let’s start with mobility. If you’re the type of person that likes to move your grill around or store it immediately after use, you should consider a grill such as the Traeger Tailgater Series. This grill is easy to move around thanks to the wheeled-legs that fold up for easy storage. If these grills are not portable enough for your needs, there are smaller options. This includes the best portable pellet smokers, several of which work as smoker/grill combos. Along with portability, you should consider the temperature of the grill. You can find grills with digital temp control and a lot of room for wood pellets. For example, the REC TEC grill comes equipped with Smart Grill Technology and is arguably the most efficient wood pellet unit on this list. It has an extra-large hopper for adding up to 40-pounds of pellets. The smart technology also offers precise temperature control. Cooking for a large group? You have over a handful of people in your family and need a wood pellet grill that can handle that demand? In that case, the Camp Chef PG24 can take on the challenge. This grill has a total of 700 square inches, so running out of room to cook your food on is virtually impossible. The digital control will also be very easy to read when getting your grill hot enough to cook. Keep in mind that the Camp Chef PG24 is one of the higher priced wood pellet grills. In addition to the pellet grills discussed, you may want to examine the top 5 pellet smokers. Owning both a smoker and a grill will give you more outdoor cooking options during the warmer months. In fact, you could even choose a wood pellet grill/smoker combo for your backyard. Understanding how your wood pellet grill operates will be beneficial in the long run and help you make an informed buying decision. Here are some basic concepts about wood pellet grilling that you should know. First, you should know more about the fuel source – the wood pellets. These hardwood pellets are short, oblong-like pieces of wood that are burned within the grill to produce heat and cook your food. In addition to heating the grill, these pellets also add a unique flavor. This pleasant wood flavor is a staple of outdoor cooking. Unlike gas and charcoal grills, the wood pellets used in these grills don’t produce harmful chemicals that have the potential to affect your food. Wood pellets are considered a natural heating source, so you will have peace of mind knowing that you won’t be applying an unnatural substance to your grilled food. Cleaning up after wood pellet grills aren’t necessarily a hassle either. It might be time-consuming depending on what brand you have, but not a hassle. According to several experienced grilling enthusiasts, roughly ten pounds of wood pellets can produce almost ½ a cup of ash, while the remainder of the pellets is transformed into energy for the grill. While you still need to empty the ashes after using the grill, this clean-up is nothing compared to the process of cleaning out a charcoal grill. Next, let’s get into how the grill operates. At the heart of each wood pellet grill is a digital control unit. There will be a visible display that will show you the current temperature of the grill, as well give you the ability to change the temperature to your liking. Depending on which brand you go with, you will be able to program the digital controller so that it can heat at a consistent temperature for an extended period. Unlike a charcoal grill, most wood pellet grills need access to electricity. If you don’t have a nearby electrical outlet, you can purchase an extension cord. This should be suitable for most backyards and trips to the park. Wood pellet grills typically cook food at a slow rate because they don’t produce a high amount of heat. These grills were originally used as an alternative to slow smoke cookers, averaging a consistent temperature between 200-400 degrees Fahrenheit. These grills mostly use indirect heat to cook food with, which also explains the slower cooking time. This is because wood pellets are typically at their best when in the presence of low to medium temperatures. Keep these details in mind as you compare brands and complete your search for the best wood pellet smokers.